The Center for Career & Professional Development works with the faculty to offer several internship/fieldwork courses that allow you to intern at an agency in your field of interest for a semester. We encourage students pursuing internships to consider registering for these courses to benefit from the added mentorship of the John Jay faculty member as well as your internship supervisor. The Center for Career and Professional Development administers several of these internship courses available to students (see below). Click here to read a full description of these courses or to view a chart of ALL internship courses (LINK TO CHARTS) at the College. *NOTE: PAD 402 is a six credit internship course and requires a total of 180 hours to be completed and for students to attend weekly course meetings. Most of the Undergraduate Academic Internship courses are offered in a structure that has the course meet 5 times during the semester for 3 hours each time, for a total of 15 hours of course meetings. The first course meeting is Internship Orientation Day which is a mandatory event for students registered in the courses administered by the Center for Career and Professional Development. This orientation is often held the second Friday of the semester. The academic internship courses will require you to complete academic work such as presentations, journals, projects, and often a culminating paper about your internship experience. Attendance at the academic internship course meetings are mandatory. NOTE: If you are an incoming transfer student without a John Jay College GPA you are still eligible to participate in the academic internship program. If you are transferring from a NON-CUNY school you will need to submit an unofficial transcript from your previous institution showing at least 30 college credits completed and a GPA of at least a 2.50. If you are transferring from a CUNY school you do not need to submit additional documentation, just follow the normal process. Graduate student eligibility for internship courses vary by department. Please consult our Graduate Academic Internship Course Chart (LINK TO GRAD CHART) or Graduate Bulletin (ADD LINK) for specific requirements. All paperwork required by employers must be reviewed and signed by the Associate Director of Academic Internships in the Center for Career and Professional Development. This process can take 48-72 hours to complete for simple agreements and as long as 3 months for legal agreements that require John Jay College Legal or CUNY Central Legal to review and sign. Please submit all internship paperwork as soon as possible to be reviewed. You will be notified through phone or email when your paperwork is ready to be picked up. Please submit all requested paperwork to the Center for Career and Professional Development for review. If your internship site requests proof of insurance please contact the Associate Director for Academic Internships. Students completing a Graduate Level Counseling Internship for the Master of Forensic Psychology are required to obtain a malpractice insurance policy coverage of at least $1,000,000 per incident, $3,000,000 per year for the entire Externship, from an insurance company associated with the American Counseling Association, or with the American Professional Agency, or an equivalently rated insurance company; and that the student will provide a copy of such insurance coverage to their supervisor. This insurance can be obtained from the American Counseling Association website and is included in ACA membership for Master’s Degree Level Students. Students may participate in multiple internships during the same semester at the discretion of the Associate Director of Academic Internships in the Center for Career and Professional Development. Students must meet with the Associate Director for an evaluation to determine their eligibility and receive approval from their faculty supervisors (if necessary). Evaluations are sent when students complete their required internship hours, approximately 1-4 weeks before the end of the semester, to the agency/field supervisor. The evaluation is considered as part of the final grade for the internship course, which is given by the assigned faculty advisor, and he/she has sole discretion in determining your final grade. Your evaluation, course assignments and attendance are all considered in deciding the final grade for the internship course. All paperwork, conversations, and expectations related to a student's successful completion of an internship course falls under the John Jay College academic integrity policy. Any student believed to have violated this policy will be referred for judicial action. The academic internship courses follow the same withdrawal procedures as other courses at John Jay College. 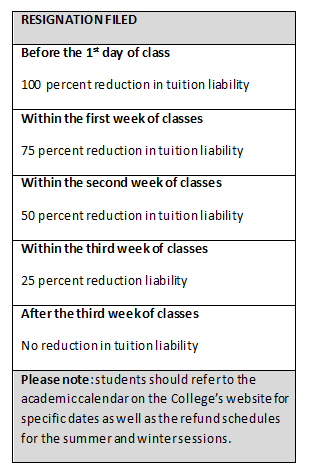 Please refer to the Undergraduate Bulletin for full details about the process (2013-2014 Undergraduate Bulletin, p. 20) (http://www.jjay.cuny.edu/academics/654.php) . The refund policy is stated below dependent on time of withdrawal. Sometimes students are unable to complete their required site hours during the course of the semester. At the discretion of the faculty member students may be given a grade of INC. If the faculty member does not submit a change of grade, the incomplete grade automatically becomes the grade of “FIN” (failed incomplete). The academic departments which offer internship courses have developed departmental policy for consideration by the College Council. Degree candidates should be aware that an INC grade received during their last semester in courses required for graduation will result in the postponement of graduation.